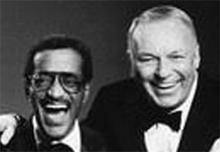 Frank Sinatra along with close friend and fellow "Rat Packer" Sammy Davis Jr., with whom drummer Rick Porrello, host of americanmafia.com, worked for in the 1980s. 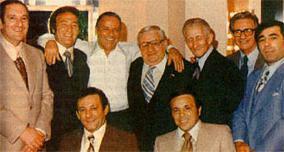 Frank Sinatra backstage in 1976 with top wiseguy admirers including Paul Castellano (standing left), Carlo Gambino (standing third from right) and Jimmy Fratianno (standing second from right). Veteran show-biz and political biographer (of Richard Nixon, J. Edgar Hoover, and Marilyn Monroe, among others) Summers teams up with his sometime collaborator Swan, shining an illuminating spotlight on Old Blue Eyes in this irresistible chronicle of the late, great crooner. Emphasizing the extreme manifestations that defined Sinatra's essential character--his ambition, his volatility, and his fervor--the authors paint a portrait of an astonishingly gifted singer who beat the odds by surviving and thriving over the course of several generations and a number of profound shifts in musical tastes and audience expectations. Aside from his natural abilities, Sinatra the man defied easy classification. Undeniably promiscuous, violent, and self-serving, he could also be tremendously compassionate, loyal, and generous. Welcome Anthony Summers and Robbyn Swan to AmericanMafia.com and thank you for taking the time to visit with us. Congratulations on the publication of SINATRA: THE LIFE. As a writer, I don’t find much time to read books. But having worked with Sammy Davis Jr. for almost three years, I have an obvious interest in Frank Sinatra, and reading your book was pleasurable and engrossing. I highly recommend it to anyone with an interest in the entertainment industry, American history, the Rat Pack era, or organized crime. RP: Of the Sinatra titles available, what makes SINATRA: THE LIFE, different? AS & RS: It’s the first comprehensive birth-to death biography, covers all aspects of the singer’s life, breaks new ground in key areas – not least on the Mafia connection and on Sinatra’s love life - and is unique in that it is fully documented. Every fact in the text is accounted for in meticulous Source notes. RP: Who conceived the idea for the project? How long did it take from inception to completion of the final draft? AS & RS: As explained in the Acknowledgments, the veteran New York editor Jim Silberman "realized there was no substantial, rounded, book on the life of Frank Sinatra, a book that sought out the truth about the artist whose shimmering talent and goodwill was accompanied by decadence and delinquency." In other words, Silberman wanted us to "square the circle." We hope we succeeded in reporting on the whole Sinatra life and personality in a way that – with witnesses dying off – will not be possible a few years from now. SINATRA: THE LIFE is the result of four years’ non-stop work, involving the two authors, a Washington researcher, and several others. RP: Who were the persons closest to Frank, such as his wife, former wives, or children, who cooperated with the project? AS & RS: Sinatra’s daughter Nancy has claimed the family were not approached for interview. Not true. We made strenuous, protracted efforts to speak with them. We wrote early on to the three children explaining that we were at work – so that the news did not reach them from elsewhere. Later, when we were well "read in," we wrote again requesting interviews. Nancy and Frank Jr. never did reply, while an attorney responded to the letter sent to Tina – it was a barely literate reply, but seemed to say he acted for the family as a whole – turning us down. We further had a letter hand-delivered to Nancy by our U.S. researcher, and approached both daughters through intermediaries without success. We also approached Sinatra’s first wife Nancy and third wife Mia Farrow through intermediaries, and were politely turned down – as we were after writing to Barbara Marx Sinatra. Our approximately 500 interviews with others included several former lovers of Sinatra, longtime friends, and others truly competent to talk about him. The names of all interviewees appear in the Source notes or Acknowledgments. Names that come to mind include Nick Sevano, Sonny King, Jerry Lewis, Shirley MacLaine, Peggy Connelly, Lois Nettleton, Leonora Hornblow, Tony Oppedisano, and Dr. Rex Kennamer. RP: You discovered that Lucky Luciano was from the same Sicilian village as Sinatra’s grandparents. How does this affect the history, the relationship between Frank and the Mafia? AS & RS: A basic task for any biographer is to research the subject’s roots, his family origins. We knew Sinatra’s father Marty had been brought to the United States from Sicily by his immigrant parents, but realized early on that – for reasons unknown – Sinatra had offered contradictory accounts as to just where in Sicily they came from. Many months of research later – in old records and on the ground on both sides of the Atlantic, and after enlisting the services of a professional genealogist – we tracked the Sinatras to the hill town of Lercara Friddi. It is in the heart of Mafia country (near Corleone and Prizzi) and was, as you say, the hometown of Lucky Luciano, the man credited with organizing organized crime in America. The Sinatras and the Lucianos (or the Lucanias as they were originally named) had lived at a relevant period on the same very short street. Of only three (rather than two, as rendered in our book) Lercara Friddi people listed in Luciano’s address book at the time of his death in 1962, one was a Sinatra relative. In theory this could be mere coincidence, but other facts suggest otherwise. The only salient thing previously reported about Sinatra and Luciano had been that they met in 1947 in Havana, Cuba. Other information now available – notably from the mistress Luciano had at the time he died – makes it evident that Sinatra and Luciano had a long relationship and were close. We have striven in the book not to color the facts, but the short answer to your question is that the Mafia connection seems to have been there from the very start of Sinatra’s life. The Sicily discovery is the start of a thread, one that goes far to explain the singer’s early and continuing entanglement – more obvious in him than in any other entertainer of his generation. RP: To be fair, Sinatra was certainly not the only major entertainment figure with significant mob ties. Tell us about how the Mafia came to be involved in the entertainment industry and who some of those other entertainers were. RP: Tell us who Willie Moretti and Joe Fischetti were and what their relationship with Sinatra was. AS & RS: Willie Moretti was a key Luciano henchman with great power in New Jersey, who cultivated a respectable front but was in fact a murderer. He and Sinatra were close neighbors at one point, and Sinatra’s denial of any real association was not true. Joe "Stingy" Fischetti was the youngest of the Fischetti brothers – Charles and Rocco, the two elder siblings, are often described as the "heirs to Al Capone. (Charlie was, too, in regular touch with Willie Moretti.) It is clear that Sinatra lied when he claimed early on that he barely knew the brothers. According to his friend Sonny King, Joe Fischetti was one of two mafiosi assigned by Luciano and New York’s Frank Costello to handle Sinatra. The other, charged with stepping in "if major things came up," was the young Sam Giancana – an assertion that, if true, identifies the start of the relationship that brought Sinatra so much trouble in the early sixties. RP: What is the most shocking fact you uncovered about Frank Sinatra’s organized crime connections? AS & RS: After all the years of rumor, we weren’t exactly shocked – unless it was by the extent to which the facts turned out to support the rumors, and by the sheer depth and longevity of Sinatra’s mob connection. And: did he really have the blinders on to the hard fact that the men with whom he socialized and whom he allowed to help him were torturers and murderers? He must have known, and that makes him to some degree complicit in Mafia crimes. How could a man who in so many other ways was intelligent – even compassionate – live with himself? RP: Frank’s righthand man Jilly Rizzo died in a fiery car crash. Tell us who Jilly was. AS & RS: The hulking Jilly Rizzo – born Ermenigildo Rizzo – was a New Yorker who once hoped to become a professional fighter. He was close to Sinatra by the sixties, and for years before his death was his closest companion. His nightspot, Jilly’s on 52nd Street in Manhattan, was long Sinatra’s favorite watering hole. As Sinatra put it, he could "clean up real good," but those in the know knew Rizzo to be a brutal heavy ready to dish out violent retribution to those who offended. It came as something of a surprise to us (though perhaps it should not have done) to discover that he was deeply involved with the Mafia. FBI documents connect Rizzo to Sam Giancana, Joe Fischetti, and the Gambino family. The mob connection caught up with him in 1990, when he and accomplices were convicted of a fraud that drained $8 million from a savings and loan association. Sinatra fell to his knees in grief and shock when he was told his friend had been killed in the fatal car accident. Rizzo is buried near Sinatra in the Sinatra family plot. RP: Did your researches shed any new light on the assassination of President Kennedy? AS & RS: Oswald’s killer Jack Ruby – who of course had his own mob connection – was in touch with someone from Sinatra’s record company Reprise shortly before the assassination, contacts that have never been satisfactorily explained. A week after the President’s murder, when his son Frank Jr. was kidnapped, Sinatra worried that the kidnapping was a message from the mob, warning him to stay silent about anything he might know that implicated the Mafia in the assassination. Late in life, Sinatra said privately that he did not believe in the Warren Commission’s "lone assassin" verdict. He said rather more than that, but the friend with whom he shared the information will not elaborate. Thank you Anthony Summers and Robbyn Swan for being with us at AmericanMafia.com. Best of luck with SINATRA: THE LIFE, a thoroughly researched and wonderfully written book about an American legend.